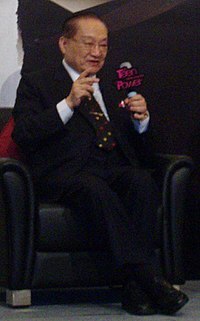 Louis Cha Jing-yong (Chinese: 查良鏞; Sidney Lau: Cha4 Leung4 Yung4) (10 March 1924 – 30 October 2018), better known by his pen name Jin Yong, was a Chinese novelist and essayist. He co-founded the Hong Kong daily newspaper Ming Pao in 1959 and was its first editor-in-chief. He was Hong Kong's most famous writer. He was born in Haining, Zhejiang. He retired from the newspaper business in 1993. Yong died after a long illness at a hospital in Happy Valley, Hong Kong on 30 October 2018 at the age of 94. ↑ "THE PRECEDENCE LIST OF THE HONG KONG SPECIAL ADMINISTRATIVE REGION" (PDF). Protocol Division Government Secretariat of Hong Kong. October 2018. Retrieved 2018-10-17. ↑ John Sturrock (1997). The Oxford Guide to Contemporary World Literature. Oxford University Press. p. 99. ISBN 978-0-19-283318-1. ↑ "Famed Chinese martial arts novelist Jin Yong dies aged 94: Hong Kong media". The Straits Times. 30 October 2018. Retrieved 30 October 2018. This page was last changed on 1 November 2018, at 06:24.